I’m teaching this December at CounterPulse. In this workshop we are practicing freedom supported by contact with other people. Freedom to let your spirit move your body. 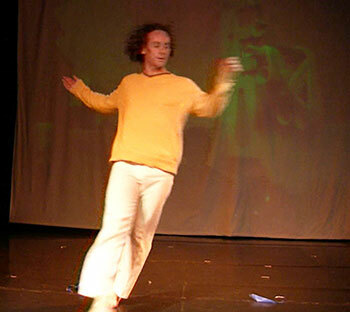 Contact Improvisation is founded on the principle that anybody can teach it. At the same time we are learning from each person that we dance with. When we embrace that paradox, finding the balance of responsibility and freedom will lead us to self-discovery. Each class in this series will begin with short exercises to expand our awareness and our movement range; Followed by a score to allow deeper discovery, with direct feedback and time to incorporate the feedback in your dance. 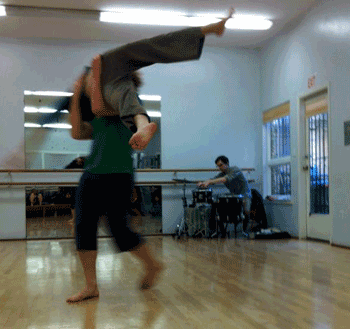 This week we will explore the balance between art and sport in contact improvisation. Back in the days before Contact improvisation was a well know social dance, Simone Forti called it an “Art-Sport.” In this class we will explore the balance between art and sport. Sharing momentum traveling through space into and out of lifts works when you have full commitment to a goal beyond the point of contact. We are going to get outerspacial striving to attain that goal. The artistry comes in the choice of which goal to strive for and how to communicate that with your partner. How can we find strength in ourselves and our partners? How can we let changing states guide us in finding a balance between expression and athleticism? We will play between the gravitational pulls of the earth and our own changing states. Thursday, individual warm up at 6:30pm, class starts at 6:45pm at the Finnish Hall. See The Thursday Jam for directions. I’ll be teaching Thursday from August 15 to September 5th, 6:45 to 8:30 at the Finnish Hall. See The Thursday Jam for directions. In these classes we’ll be focusing on dancing from our brilliance and our shadow. Bypassing expectations of what Contact Improvisation should be and moving toward allowing our bodies to express the ever changing shape of our spirit. Everybody is welcome. I’ll be dancing with Peiling Kao. “Imprint” is an extended exploration of distance and mediation. How do human beings maintain personal intimacy over physical distances? How do artists collaborate despite differences in media/material? “Imprint” aims to unite choreographer and musician under a common score and explore how modalities of choreography and composition connect and overlap, evoking a new way of creating for artists and a new experience of seeing for audiences. I’ll be teaching the Saturday Contact Improvisation class at ODC this week and next.